How solar system arrangements and common planet types don’t match our Solar System. If you’re a Star Trek fan, then chances are you know about the planetary classification scheme that’s used to identify a planet so you know what to expect of the world before you get there. The solar systems devised were no doubt ahead of their time, however they were modeled largely after the only planetary model the creators had at the time – ours. Hence the reason why most of the rocky planets are nearer their star, while the jovians (large gas planets) were located further out. Since then, astronomers, using such sci-fi classics as Star Trek as inspiration, have discovered over 1000 exoplanets orbiting dwarf stars of all sorts, and only within a small sector of our interstellar neighbourhood. It has even warranted a planetary classification system; fixed, of course, to represent the true distribution of exoplanets in the galaxy. To the right we see our Solar System, click it to enlarge. There are eight planets in our Solar System, which is still more than what any other known solar system has to this date. And notice in the diagram at the top right where the small, rocky bodies are located, compared to the large, jovians. Now look at this schematic of all the exoplanets discovered not using the Kepler Space Telescope, and compare this to that of our Solar System. 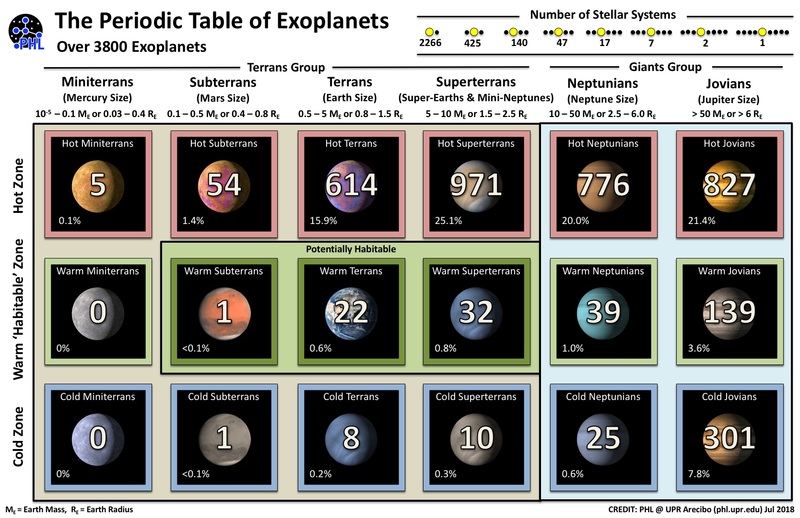 Notice where most of the exoplanets fall – Hot Superterrans, Hot Neptunians, Hot Jovians, Warm Jovians, and Cold Jovians. Except for the Cold Jovians (we have two of our own), these groups contain planets that are, in some cases, completely alien to the planets we’re familiar with. This planetary distribution found by the Kepler telescope shows again a spread – this time, Hot Subterrans, Hot terrans, Hot Superterrans, Hot Neptunians, and Hot Jovians. Except for the Hot Terrans (Venus goes into this category), these planetary groups are also quite different to what we’re used to seeing. 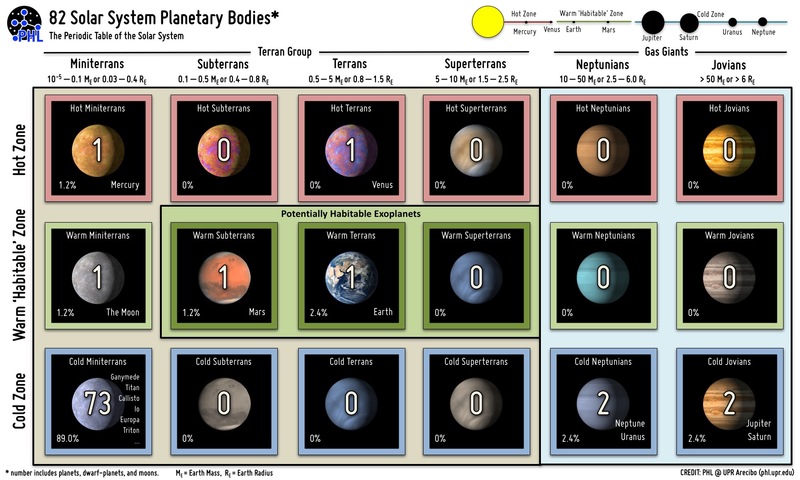 Below you see the most common solar system layouts we’ve come across so far (generally-speaking). Notice how none of the above looks like our own. So why are there so many hot worlds? Well, we’re working on it…These exoplanetary systems really are alien in most cases, and it’s even forced astronomers to reconsider the model of solar system formation that seemed so accurate before we starting finding exoplanets left, right, and center. It’s even beginning to look as if our Solar System is the mutant of the galaxy, since it, unlike the vast majority of exoplanetary systems, doesn’t seem to show much signs of the inward migration so prevalent in other star systems. It kind-of begins to make Star Trek look unimaginative, doesn’t it? This ignores the bias inherent in the Kepler data entirely. Planets that are large and close produce much greater observable effects on their host stars. It’s telling that the vast majority of exoplanets we’ve discovered are “hot Jovians”. Most of them, in fact, are significantly larger than Jupiter. Massive gas giants orbiting very close to small stars are far easier to see than planets of Earth-like size and orbital position, so of course the former are the kind we see the most. I think our statistics right now have far more to do with the relative primitiveness of our instruments than anything else. I thank you for your comment, and apologies for the delay..
equally tiny portion of the Milky Way. will hopefully confirm or deny the current periodic table distributions. According to these numbers coming from Kepler, Jupiter size planets typically migrate into the inner solar system, swallowing up any rocky planets therein. That we haven’t found any earth sized planets in the habitable zone yet is no surprise, but that there have been ten super-sized rocky bodies thus found still leaves room for discovery ~ that only a tiny fraction of the sky has been thus mapped leaves room for hope. Agreed. The beauty of science is that a model for a certain aspect of reality (in this case exoplanets) is seen as accurate so long as all the evidence supports it. Once something comes along that challenges the current model (say, scanning a different portion of night sky), then the model is forced to change in order to keep it accurate with the new aspect of reality. It is necessary to note that the Mercurians, Subterrans and Terrans are more difficult to detect, in that order, than the larger-class planets. Many systems we scanned may contain smaller bodies that we failed to discern for various reasons. Our own solar system still is surprising us with decent sized objects we have failed to notice, and they are proportionally massive when considering the distances Kepler is operating at. 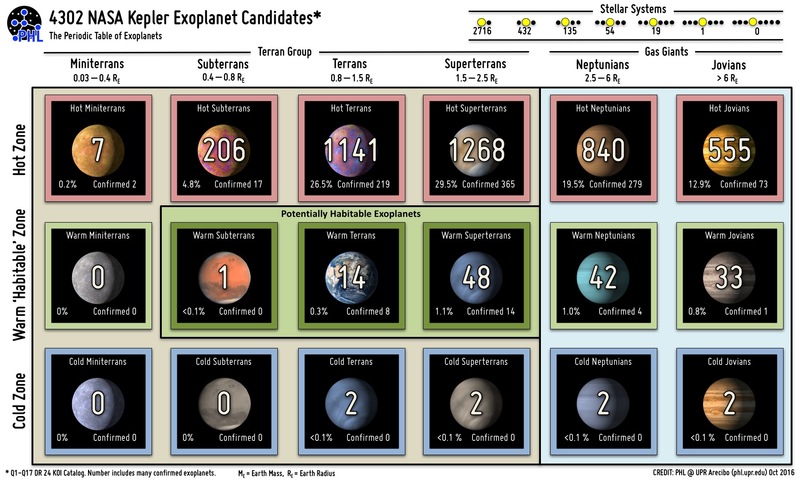 My guess is that these “exoplanetary periodic tables” will eventually be revised in the direction of our own system. Our arrangement still may be off of the statistical norm. The five star systems I (so terribly) sketched in this article are some of the most common star systems thus found, drawing from thousands of such systems. The most common systems appear to be those with the least amount of planets in orbit about them. Of course we may end up finding more systems more like our own in the future, although I still think it’ll be more common for those systems to contain, say, a couple rocky planets with only a couple more jovians orbiting further out. We already see vague instances of this in systems like 55 Cancri.